I pulled this box of pins from the forth bag from the right. It was in amongst a bunch of crumpled up newspaper from the 80s. The rest of the bag wasn’t too interesting, surprisingly, just food waste in smaller plastic bags. 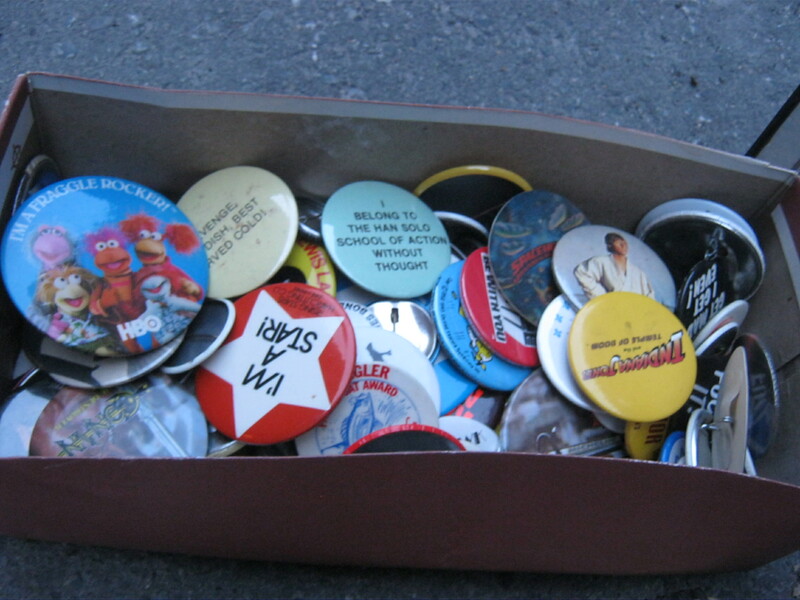 These pins are about movies or TV shows. Some big time names here, including James Bond, Conan, Indiana Jones, Invasion of the Body Snatchers, and the Rocky Horror Picture Show. 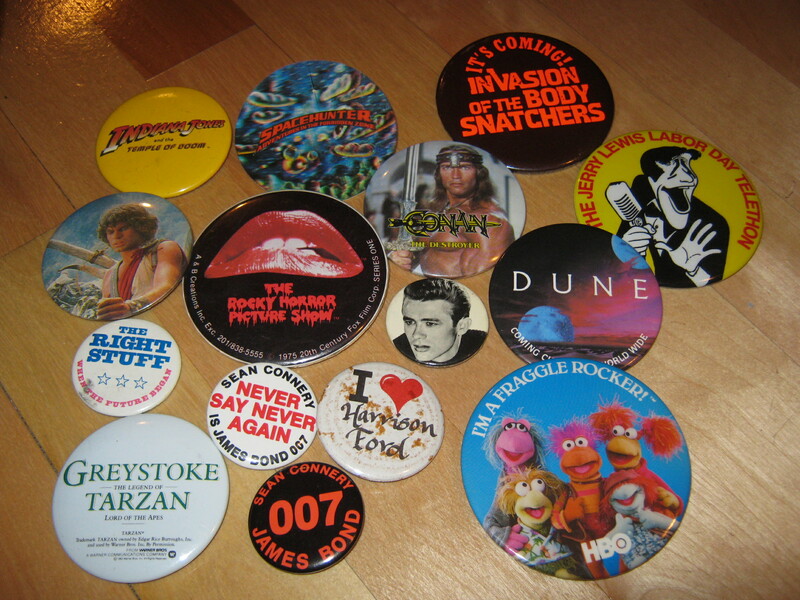 Also a nice Muppets pin (“I’m a Fraggle Rocker”), a very creepy depiction of Jerry Lewis promoting his telethon, and a “I love Harrison Ford” pin. Some of these might be worth a few bucks to collectors. 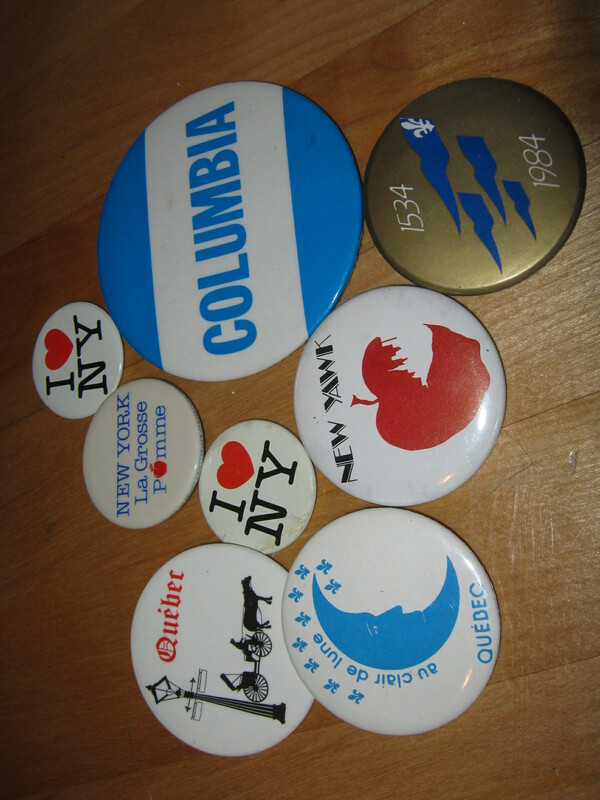 Some miscellaneous pins. There’s also some wings for a TWA flight staff member. I think the guy on the far left (2nd up) is probably from a movie too, but I don’t recognize him. 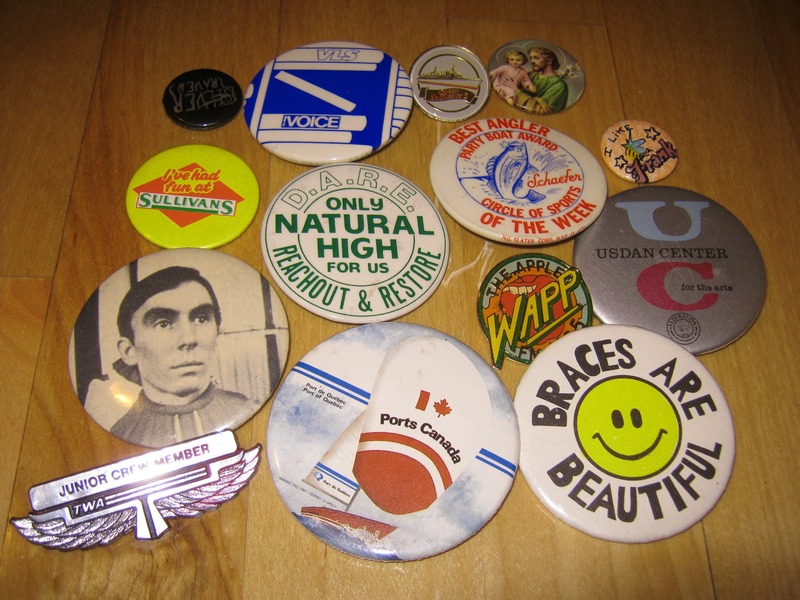 The “WAPP” one is for a New York radio station and was made sometime in the early 80s. 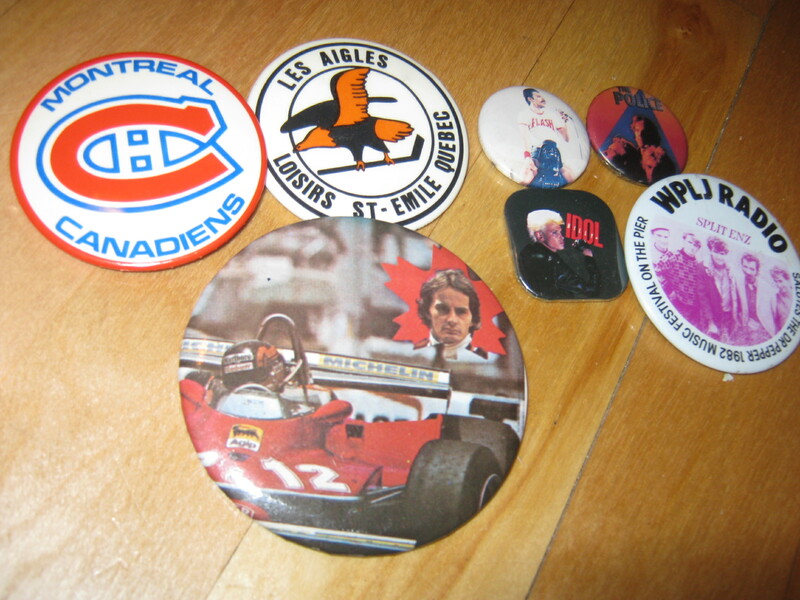 Some sports pins with some band pins. The Montreal Canadiens one is really nice. Now some classic “phrase” pins. “Have you made peace with your parents?” is an odd one. I think it was made for a book by the same title, but still. 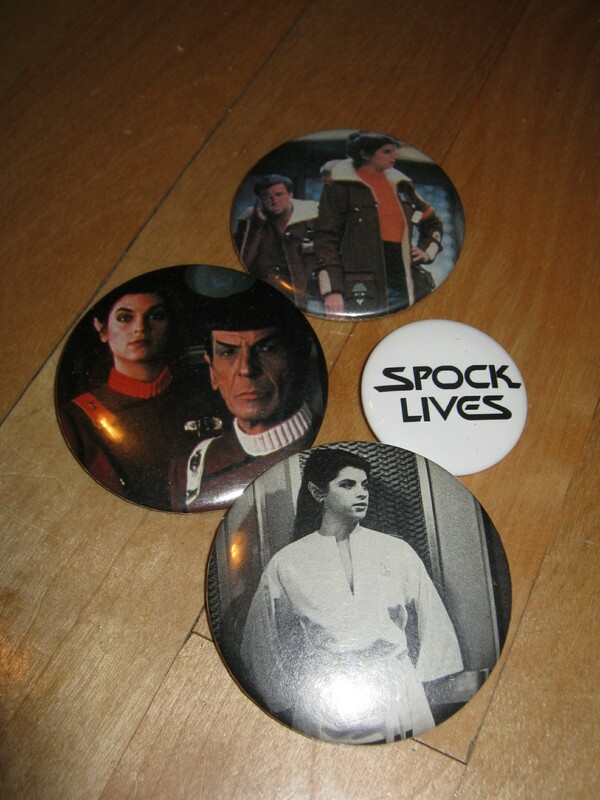 And now some Star Trek pins. Some pins for different places. And now my favorite pins. 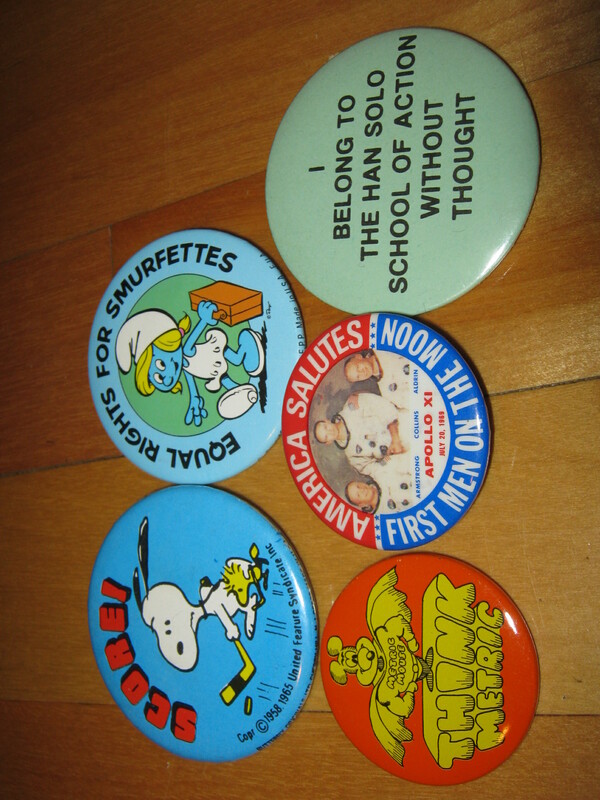 We have a nice vintage “Snoopy” pin, an “Equal rights for Smurfette” pin, “Think Metric” featuring Metric Mouse, a moon landing pin from 1969, and a funny pin that states: “I belong to the Han Solo school of action without thought.” I looked up the last one but didn’t find anything so I figure it’s home-made. 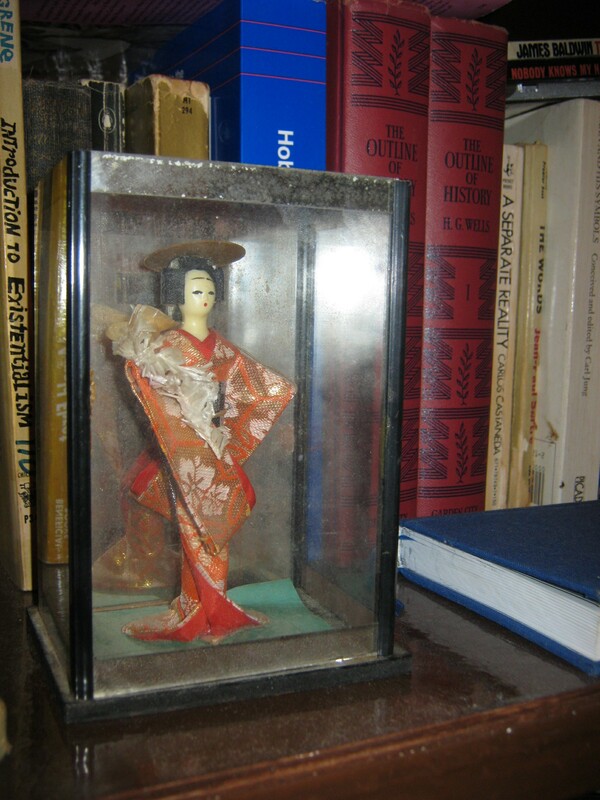 I also found this Japanese doll in a glass box (which needs to be glued in place again, and may be missing the top). The bottom says OMC, which stands for Otagiri Mercantile Company. I don’t know much about this, but it’s kind of cool. Anyways, that’s all for now. Hopefully I find more good stuff today! That is a cool collection. I am sure that someone would want a lot of those pins. 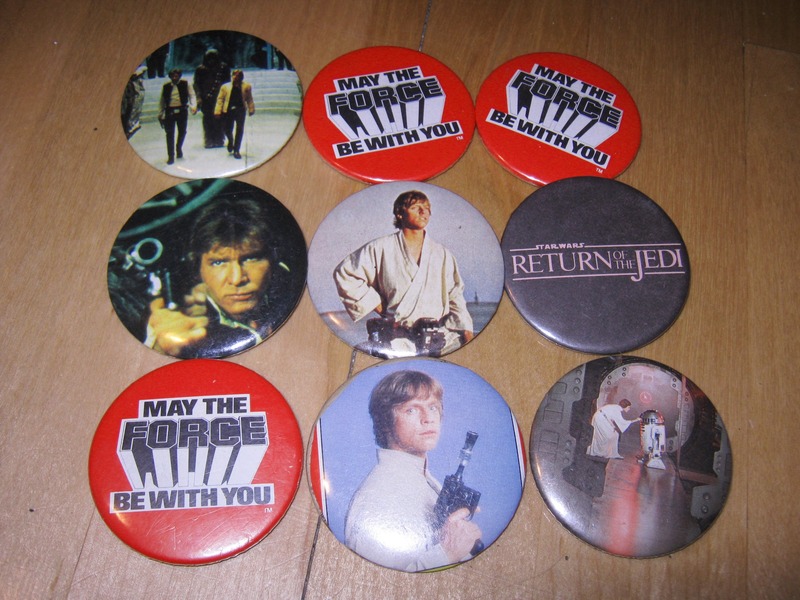 One of the pins that you have listed as miscellaneous should be in with the movie pins. In the group right under the Star Trek pins there is a pin of the boy from E.T. Oh yeah, I forgot about him! Nice pin collection. The guy in the costume seems familiar, maybe a character in an old SF show. I’m thinking it may be one of the older pins in the collection. Now this brings me back to my childhood. I totally forgot I had a pin collection until I saw your post and was reminded of them all. What a great find! My badge collection! Wherever did you find it? I jest, of course, but it really looks a lot like the ones I owned, a long time ago. Hey! I was just looking up some RHPS photos and came across this page. How lucky!! Are you willing to sell any of the pins?? 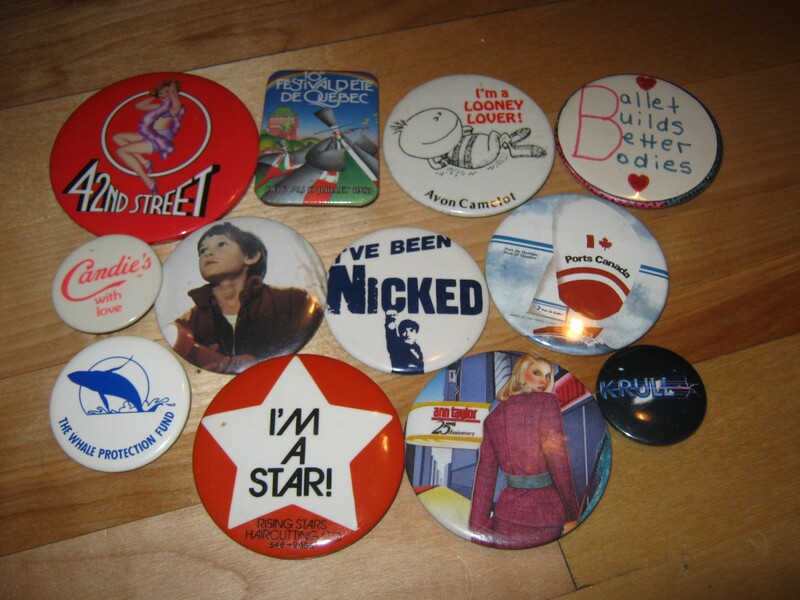 Most of these pins are long gone I’m afraid. They made me a nice little amount at a yard sale. RHPS was definitely sold. If I find more I’ll let you know!